The Wood Designs Art Center for Two provides the fun of co-creation and, at the same time, gives each child privacy, so he or she can focus on the work. 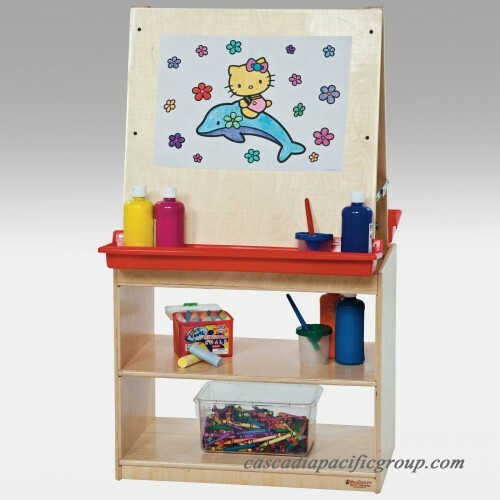 When little ones work together at a double-sided easel on artistic projects, the sparks of inspiration fly. They can encourage each other, compare designs, and challenge one another to create. The deep mounted trays hold paints, crayons, and brushes. They are wide enough to accommodate jars and containers. The sturdiness of the easel comes from its base: a wide, real-wood, two-shelf base perfect for storage of larger containers and paper. 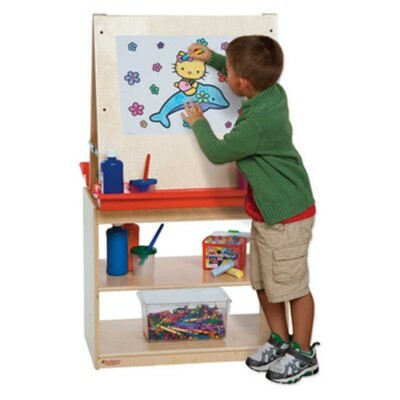 Stock up well, because this easel is destined for hours of artistic fun. Dimensions: 25W x 16D x 44H in. WARNING: CHOKING HAZARD. This item contains small parts and is not intended for children under 3 years of age.